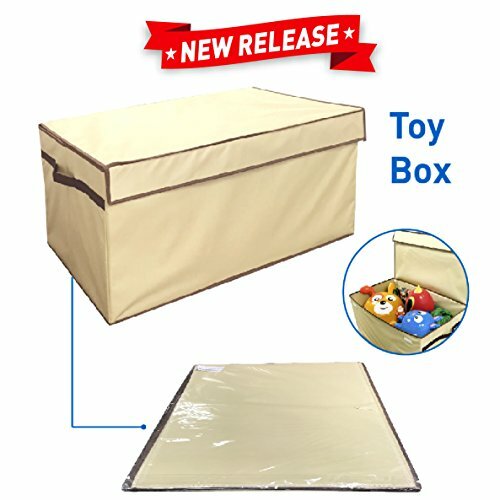 Our collapsible toy chest storage bin helps to organize and store toys either as a toy chest nursery necessity or it is stylish enough with its neutral colors of light beige and dark brown trim, it to be used in any other room in the house. Made of durable and strong fabric, this toy trunk can hold bigger toys or a large number of toys, and it will last years. Measuring 30" wide x 16" deep x 15" tall, the toy chest organizer is large and will be beneficial to any playroom. With its built-in handles and lightweight material, moving from room to room to pick up toys is effortless. The folding collapsible toy box design allows it to be easily stored when not in use and the price is right. ORGANIZED AND STYLISH - Our kid's toy chest helps you organize and store toys that would otherwise be all over the house. This toy chest furniture with neutral colors is stylish and could be used in the nursery or any other room in the house. STRONG AND DURABLE - Measuring 30" wide x 16" deep x 15" tall, our toy trunk storage can hold numerous toys and bigger sized toys. Made of quality material, it is not just a toy chest organizer, it can store a variety of items and is durable enough to last. STURDY AND SAFE - Made of fabric with Velcro closures and a flip-flop lid, this toys box is safer than a wooden toy chest that could smash fingers and its sturdy design makes it versatile enough for all ages. EASY TO MOVE, EASY TO STORE - The built-in side handles make our toy box organizer easy to move from room to room when picking up toys. The collapsible folding design allows for easy storage when not in use. 100% SATISFACTION GUARANTEE - We are so confident that you will like our Folding Toy Chest that if you return it within 30 days, we will give you a full refund on the product price. Try it, we know you will like it!